As a kid Pavakkai is one vegetable I hated the most and my parents forced me to eat it whenever it was made. I had many ways of avoiding it and one such trick was to slowly put it under my plate and mush it so that it sticks to the plate and nobody will notice it. I would then wash it away when done with my food. I hated the days when Pavakkai was made until I got married. My husband loves Pavakkai and so does my daughter. I was ashamed when my little daughter started having Pavakkai without any fuss and she in fact liked it a lot. I started trying few recipes that both of them liked and made sure there was not much bitterness to the dish. 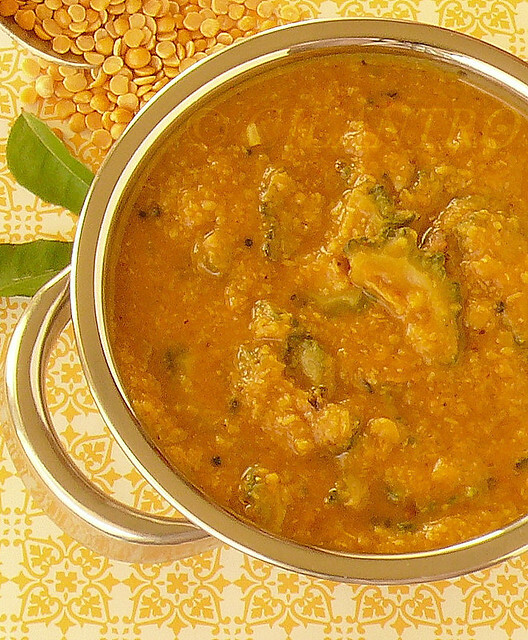 One such recipe is the Pittlai a traditional Tamil dish made with paruppu/dhal, coconut and spices. If I can manage to have it then most of you should be able to have it. Do give it a try and let me know. Heat a tablespoon oil in a kadai/pan and roast the ingredients to grind in the order given and grind to a smooth paste. Keep aside. Cook the paruppu and set aside. Extract pulp from the tamarind and set that aside too. Heat another two tablespoon oil and add the sliced Pavakkai. I cut the Pavakkai into two lengthwise and then thinly sliced them. Discard the seeds if any. Fry the pavakkai until it turns crisp and then add the cooked paruppu, tamarind extract and the ground coconut masala. Bring it to a boil. Finally add jaggery and grated coconut. Heat a teaspoon oil in a separate kadai and season the mustard, paruppu and curry leaves and add to the pittlai. Serve with Rice and Appalam/Papad. TIPS: It is not necessary to make the Pavakkai crisp and it could be just cooked and added to the dhal. This will be more bitter so it depends on how bitter you want the pittlai to be. Adding grated coconut towards the end is optional. Adjust red chillies according to your taste buds. This dish is supposed to be mild. Very healthy n delicious combo...yummy!! Hope u'll drop by my space n join it too.. I also like paavakkai but only if some sugar/jaggery is added to balance the bitter taste. The same with mango curries. Your dish looks very sumptuous. Same as u said. I dont eat pavakkai till i got married. I too like pavakkai in pitle version. I made the same yesterday but with the jaggery as my hubby likes it little bitter.Yours look yummy!!! Agreed; this is such a vegetable.. perfect for rice. Seriously cant take my eyes from ur irresistible click,super tempting pitlai..
Pitlai looks yummy and flavoursome. Its been almost 5 years since I had this, my mom makes but never ate, but now feel like having :) Nice recipe!